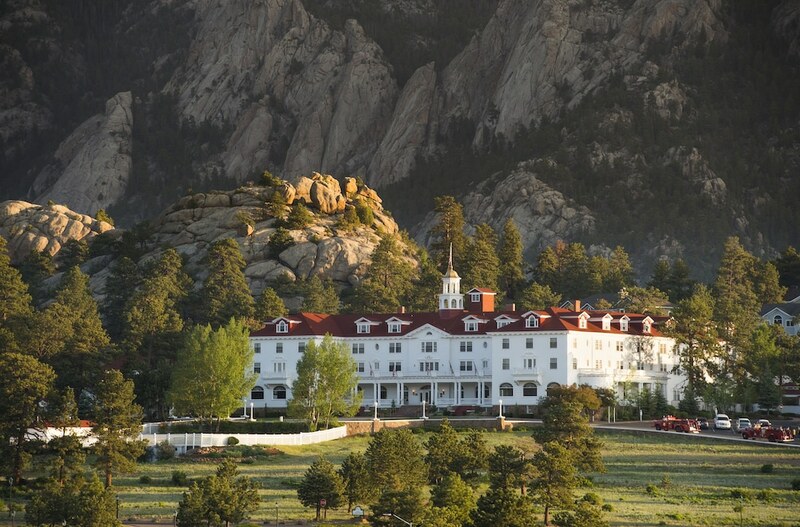 Stanley Hotel offers accommodations throughout the area in Estes Park. Make yourself at home in one of the 186 air-conditioned guestrooms. Complimentary wireless Internet access is available to keep you connected. Bathrooms have complimentary toiletries and hair dryers. Conveniences include phones and irons/ironing boards, and housekeeping is provided daily. Enjoy recreation amenities such as a fitness center or take in the view from a terrace. This hotel also features complimentary wireless Internet access, concierge services, and gift shops/newsstands. Featured amenities include a business center, complimentary newspapers in the lobby, and a 24-hour front desk. Planning an event in Estes Park? This hotel has facilities measuring 14000 square feet (1301 square meters), including conference space. Free self parking is available onsite. Set on a hill overlooking the town of Estes Park, this four-story resort is five miles from Rocky Mountain National Park. Built in 1909, the resort's Overlook Condos, the Lodge and the Aspire Residences are separate buildings located on the hotel property adjacent or nearby the main historic Hotel. The resort combines a rich history with modern amenities such as a business center, meeting rooms, conference space, and complimentary high-speed wireless Internet access available throughout the property. Other renovations include The Lodge at The Stanley, a newly remodeled 40-room boutique resort adjacent to the main building. Self parking and garage parking (surcharge) are available on-site. The property's restaurant serves Continental cuisine with an emphasis on Colorado game. In summer, guests can dine on an outdoor patio with a waterfall. Guests can learn more about the history of the property and experience a little of the paranormal by taking one of the ghost and history tours offered daily. Cascades Restaurant and Lounge - Continental cuisine meets Colorado game in this fine-dining restaurant, which serves breakfast, lunch, and dinner. During summer, guests can dine on an outdoor patio with a waterfall. Reservations are strongly recommended. Daily specials and a bar menu are offered in the on-site at the newly renovated Whiskey Bar. Steamers Cafe - Premium espresso drinks and fresh-baked pastries; also sells Stanley Hotel merchandise. Complimentary wireless Internet access. In warm weather, area activities include hiking, climbing, mountain biking, rafting, four-wheel driving, and boating on Lake Estes, a half-mile from the hotel. Two public golf courses, the Estes Park and Lake Estes Executive 9, are one mile away. Winter activities include cross-country skiing, ice skating, sleigh rides, snowshoeing, and snowmobiling. Guests can explore Rocky Mountain National Park and Roosevelt National Forest on horseback from the Cowpoke Corner Corral and National Park Gateway Stables. The company offers scenic rides lasting from one hour to all day. Pony rides are available for children. The newly added Stanley Archive tour gives guests a behind-the-scenes look at this historic property. Guests can also learn more about the history of the hotel and experience a little of the paranormal by taking one of the ghost and history tours which are offered daily. The Stanley also offers other onsite exhibits such as the Butterfly Encounter and a sculpture garden. The condo, lodge, and aspire room types at this property are located in separate buildings adjacent or nearby the main hotel. For more details, please contact the property using the information on the reservation confirmation received after booking. Accommodations are situated at multiple addresses. A resort fee is included in the total price displayed. The property has connecting/adjoining rooms, which are subject to availability and can be requested by contacting the property using the number on the booking confirmation. The property allows pets in specific rooms only and has other pet restrictions (surcharges apply and can be found in the Fees section). Guests can arrange to bring pets by contacting the property directly, using the contact information on the booking confirmation.